The free solution for your context sensitive help system - a good alternative to CHM or HLP help viewer. Also with your identity - logo and company data!Use PDF files in your programs help system and as user manuals! Which tool and which file format do you use for displaying the program help in your software - Typically the software of today stores its help in .CHM-format. But .chm files are potential carries of security threats and are oft blocked by the security software.  - The HTML-format requires a lot of separate files (texts images etc.). - The HLP-format was introduced with Windows 3.1 and does not correspond to the actual technical level any more. Also the HLP-Viewer WinHlp32.exe is no more distributed with Windows Vista. - PDF files are a good solution but a separate reader is required. The free Adobe Reader provides no possibility to realize a context sensitive help. Besides Adobe Reader is no more easily distributable. 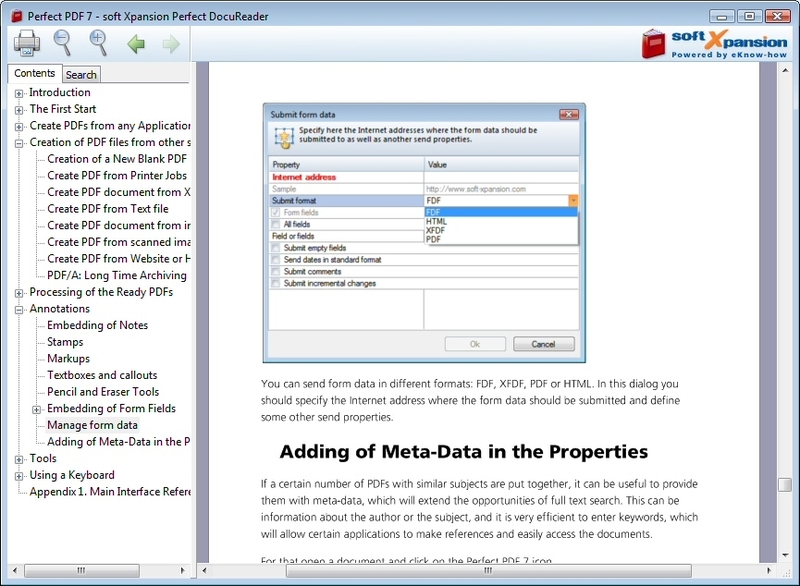 The solution: use Perfect DocuReader from soft Xpansion! Start the program directly from your application like this: DocuReader.exe PDF_filenameorDocuReader.exe PDF_filename page_numberorDocuReader.exe PDF_filename named_destinationand all the necessary functionality for the help presentation are available. The Perfect DocuReader functions: - Open read and display any PDF files - Show the needed document page at start - Use named destinations to display the desirable text at the start - Navigate using the bookmarks links buttons Next page and Previous page - Zoom and search function- Printing functionalityTry it! Its easy! 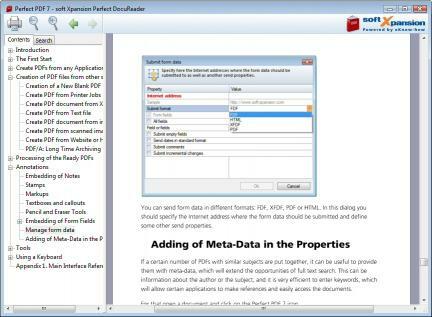 No installation required.Commercial usageThe free version of Perfect DocuReader for the commercial usage starts with a splash screen and shows the logo of soft Xpansion in its toolbar. You can receive your own version with your own logo and splash screen (or without it) instead of those of soft Xpansion. Please contact us (www.soft-xpansion.com)!